One of the principal symbols of The Fourth Way is a circle whose circumference is divided into nine parts that are joined within the circle to a triangle and an irregular six-sided figure, the enneagram. According to Gurdjieff, the enneagram is "the fundamental hieroglyph of a universal language." Gurdjieff's use of the word hieroglyph, of course, points to Egypt. In this context, it is interesting to consider the nine deities established at Heliopolis in the Early Dynastic Period as part of the cosmogonic or creation myths. These cosmogonic tenets are given in the Pyramid Texts of the Old Kingdom. The frontispiece of the Arithmologia by the Jesuit Athanasius Kircher(1601–1680), published in 1665, shows a figure not identical but somewhat similar to the enneagram. 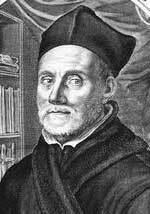 Kircher was a man of the Renaissance in pursuit of origins. His studies in magnetics, acoustics and medicine led him to attempt to decode Egyptian hieroglyphics. According to one source, Kircher regarded the ancient Egyptian religion "as the source not only of Greek and Roman religion but of the beliefs of the later Hebrews, Chaldaeans and even the inhabitants of India, China, Japan and the Americas, colonized in turn by Ham's progeny. Therefore, he believed that by studying these later and better recorded beliefs one could extrapolate the earliest religion of mankind, that of ancient Egypt." Like The Fourth Way itself, the enneagram has not been known up to the present time. "The enneagram," said Gurdjieff, "has for a very long time been preserved in secret and if it now is, so to speak, made available to all, it is only in an incomplete and theoretical form." 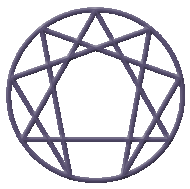 This, and the fact that it is a part of a teaching, has not deterred those who have sought to market the enneagram, divested of its deeper meaning and application, as a psychological tool. See William Patrick Patterson's Taking With the Left Hand.